Under the tumultuous new presidential administration, even the ever-objective world of academia has begun to engage with activism. A talk was held by Danish scholar, Bjarke Oxlund, in the Anthropology Lab last Wednesday, May 3, to discuss tensions between feminism, activism and anthropology. Oxlund posed the question: can we afford awkward relations? In his presentation, Oxlund put feminism and anthropology in dialogue by using his two correlating positions as a springboard to talk about tension between the two fields. The two fields are not always complimentary, Oxlund argued. While feminists point the finger at anthropology’s tendency to speak for others, anthropologists can’t see past the culture-based fissures in feminist thought. Referencing the #WeAreAllFeminists hashtag, Oxfund pointed out that most anthropologists will claim to be feminist. But does their deeply analytical work allow them to be feminist anthropologists? Or can they only be anthropologists and feminists, folding activism and academia into neat piles, separate but equal. Oxlund spoke to praxis in academia, saying that it is one thing to have an open mind to theory, but another thing entirely to practice it. His solution to this conundrum is to practice “grounded theory,” working like grassroots from the bottom up with these questions in mind. “Anthropology departments have become really big, we need to have something to show for that, both in what our students do and what we say back to the world,” Oxlund said. Paralleling the idea of praxis, Oxlund offered advice on how to get towards a dual goal of commitment and curiosity: identifying one’s own personal and political investment, developing one’s scholarly curiosity and maintaining a dialogue between the two. A critical discussion followed to get at the nuance between speaking with someone and speaking for someone. The Coalition of Immokalee Workers (CIW) was used as an example by third-year Alex Schelle, who has a long history of working with the organization. She explained that the coalition is a movement led by farmworkers, for farmworkers and that this method of origin is consistently reflected in their practice. For instance, an Immokalee farmworker is almost always a key speaker at CIW events, ensuring the right person has the mic. Oxfund absorbed the example and responded with another depicting the nuance between allyship within a cause and allyship outside of it. He emphasized the importance of raising an issue into the mainstream, arguing that successful movements have allies who are not personally impacted by the injustice at hand. A student at the table asked the room to consider, who is the mainstream? After a pause, Oxfund replied that it depends on the concentric circles around the issue. The workshop ended with a spacious period of Q&A. Third-year Hayley Trejo asked Oxfund a hard-hitting question: what would you tell yourself as an undergrad? His response was “learn more.” Recalling his steadfast politics at the time, he concluded that, if he could go back, he would have spent more time allowing for confusion. 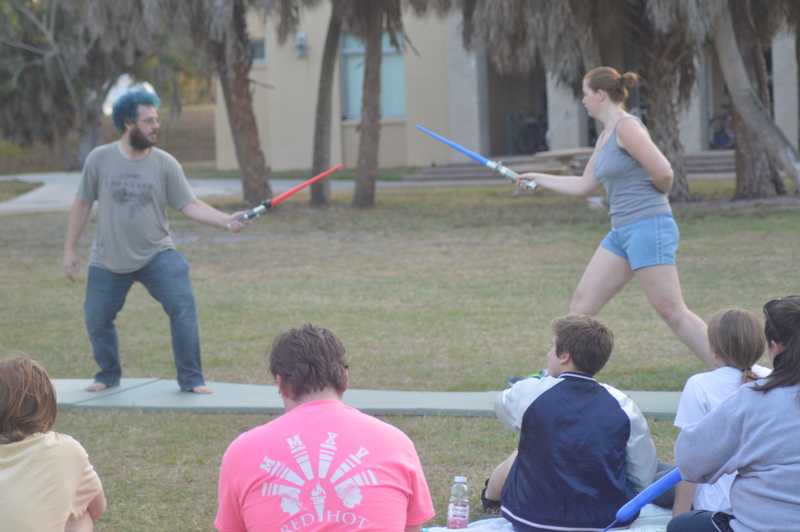 May the Fourth be with you: New College Celebrates “Star Wars” day.